Experiment details: "H/D exchange in the urea-denatured state. 15N-hFGF-1 was denatured using 4 M d4-urea in phosphate buffer containing 100 mM ammonium sulfate (AMS buffer), pH 4.0. The final protein concentration was 0.5 mg/mL. The pH values described below are all direct pH meter readings. The recovery of the protein after refolding under these conditions was measured to be ~99%. H/D exchange of the denatured hFGF-1 was initiated by the addition of a 10-volume of deuterated AMS buffer that contained 4 M d4-urea, at pH 4.0 and 25 °C. The exchange was allowed to occur for defined times under the denaturing conditions. The exchange was then quenched by rapidly adding 10 times the volume of the sample of ice-cold deuterated AMS buffer, pH 6.9, to allow the sample to refold." Experiment details: "All experiments were carried out at 20 ± 0.1 °C using a RQF-63 rapid mixing quenched-flow apparatus. Complete denaturation and exchange of the backbone amide protons with deuterium was achieved by dissolving 4 m urea into a uniformly 15N labeled hFGF-1 solution, previously equilibrated for 24 h in D2O at pD 6.6 ± 0.2. 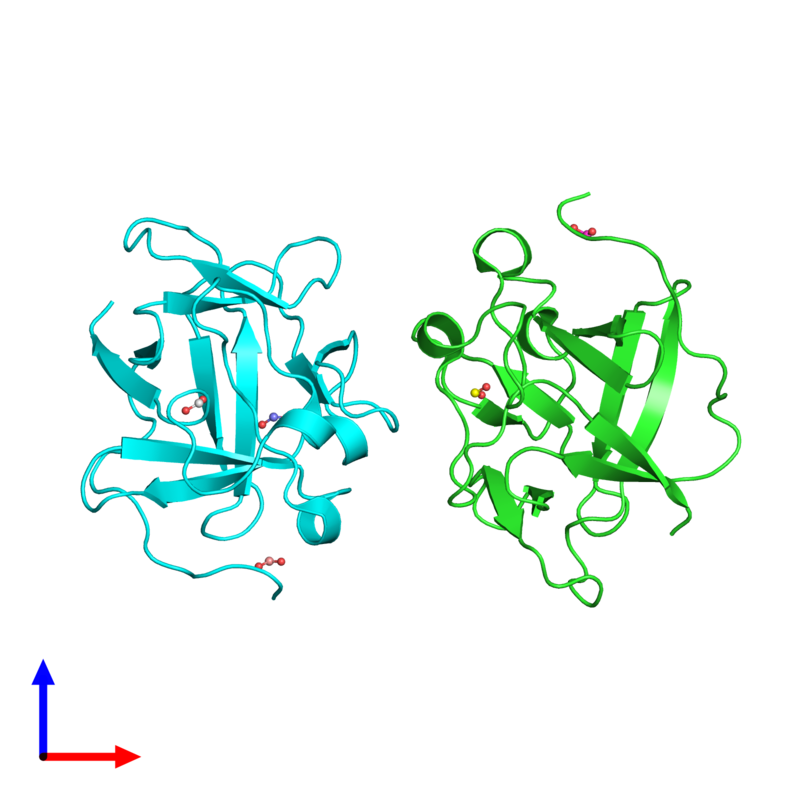 Refolding of the denatured protein was initiated by a 10-fold dilution with 100 mm phosphate buffer (pH 5.0, containing 100 mm ammonium sulfate) prepared in H2O. At this pH, negligible labeling occurred. After variable refolding times ranging from 8 ms to 100 s, the solution was diluted again to 10 times the initial protein volume with 100 mm phosphate buffer (pH 9.0) (containing 100 nm ammonium sulfate), to initiate labeling of the deuterated amides in hFGF-1 with protons. After a lapse of 10 ms, the labeling phase was stopped by a further 3.4 times dilution of the initial protein volume with 1 m phosphoric acid in water. It should be mentioned that there were no signs of aggregation during any of the refolding steps in the quenched-flow experiments." Experiment details: "H/D exchange was initiated by dissolving dry protein in 10 mM phosphate-buffered D2O at pD 6.0 and pD 7.0 (at 25°C), respectively. All NMR data acquisition parameters were preset using a mock sample, and sample pH was measured after the experiment to minimize the dead time. The first 1H-15N HSQC spectrum was acquired after 8 min of initiation of exchanges. Fifty spectra were collected in 48 h with various time points, and another eight spectra were collected in 1265 h."